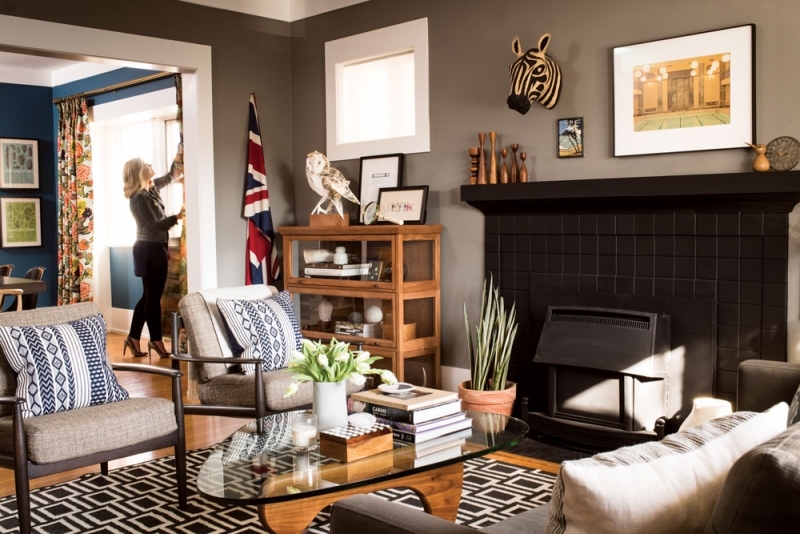 Interior designer Sarah Ward’s home is as eclectic and engaging as the spaces she creates for Calgary’s top restaurants. 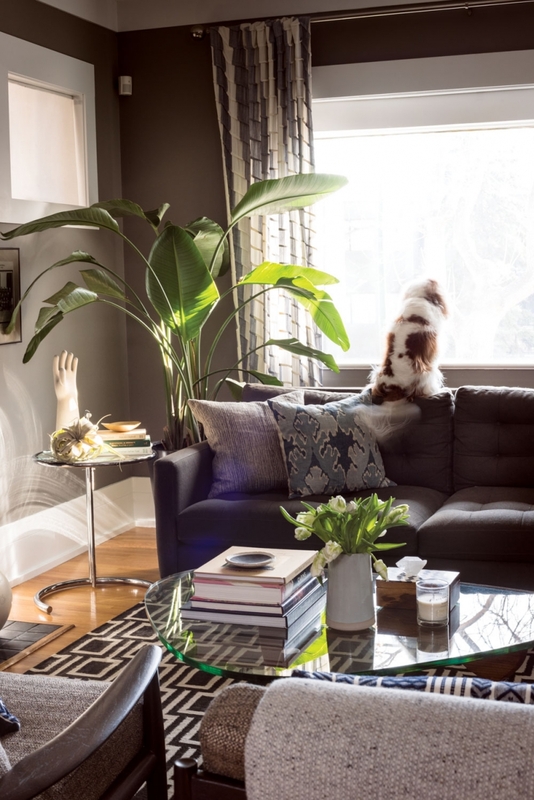 The living room in designer Sarah Ward’s home maintains a mid-century aesthetic with vintage-style chairs and a Noguchi-style coffee table.Vintage chairs; Embroidered cushions from Schoolhouse Electric Co; Barristers bookcase from Crate & Barrel; Owl by Anna-Wili Highfield; Zebra from Anthropologie; Chateau by Jeremy Kohm, available through 20×200.com. With a client list that includes The Nash and Proof, interior designer Sarah Ward is known for transforming spaces into eccentric and eyecatching cocktail bars and refined restaurants. The Murray portrait and a cross-stitch of The Royal Tenenbaums serve as part of a running Wes Anderson theme. A framed photograph of a hotel pool, while not directly linked to the quirky film director, is in line with his unique aesthetic and colour palette. Ward took six months to decide on the fabric for her Eero Saarinen womb chair. The coveted designer piece is a focal point in the black library – a place to curl up, relax and read. This was no impulse purchase, but a long-held desire to own one of these chairs finally realized. “Ever since I was in design school, this was the chair I wanted,” she says. That philosophy means Ward practices patience when it comes to adding more expensive items to her home. The dining room drapes – saturated in colour with bold dragons and bright chrysanthemums and peonies – are a fabric Ward had long desired before finally purchasing. The first piece of fine art she and husband Dave McDougall purchased was a painting by Heidi Conrod. The couple initially walked away from it to mull over. “It’s important to wait with fine art,” says Ward. 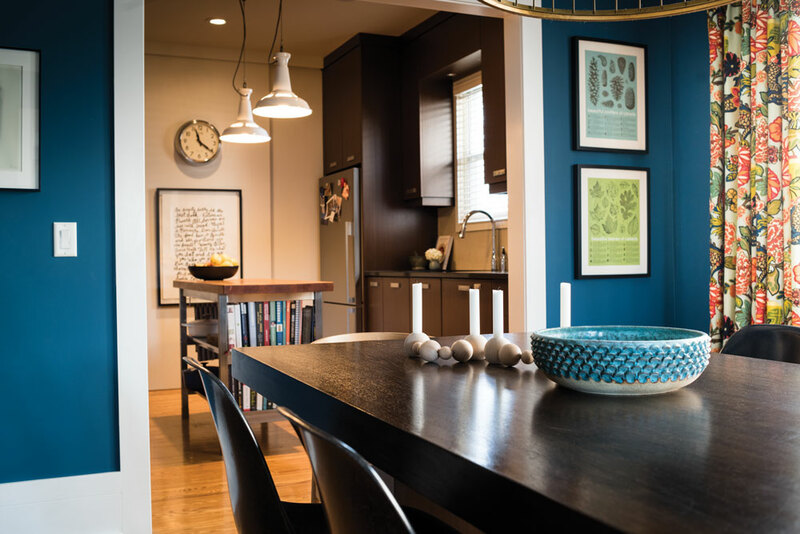 The modern piece, with its lively strokes of auburn and orange, teal and smoky blue, now hangs in the dining room and was the couple’s fifth anniversary gift to each other. “It feels like it’s us in colour,” Ward says. There are no framed family photos, shots from Ward’s wedding to McDougall or snaps from vacations away, but family mementoes and souvenirs from travel are always close at hand in subtle ways. 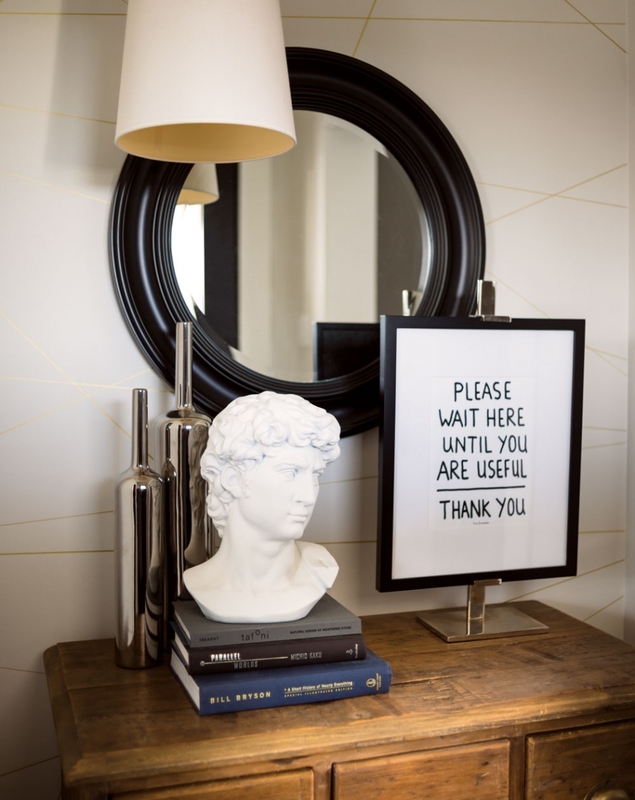 A signature of Ward’s home-design sensibility is incorporating covert reminders of the people she holds dear. The unexpected black-and-white shot of a 1938 high-school rugby team includes McDougall’s grandfather; a painting by Ward’s sister of a Cavalier King Charles spaniel is a portrait of Ward’s first dog; and the framed pressed flowers on display in the living room are from her grandmother’s garden. It’s a way of secretly having reminders of family and loved ones nearby in a unique way. “I like belongings instead of framed pictures,” says Ward. Ward treats vacation souvenirs the same way. A black, nubbly chunk of lava from a trip to Iceland, a large framed poster of Lugano (cheekily purchased in Hawaii) and a handmade shaker box, steamed and hand nailed, from a village in Vermont all serve as unconventional reminders of the trips she and McDougall have taken together. “I love things that have a story,” says Ward. 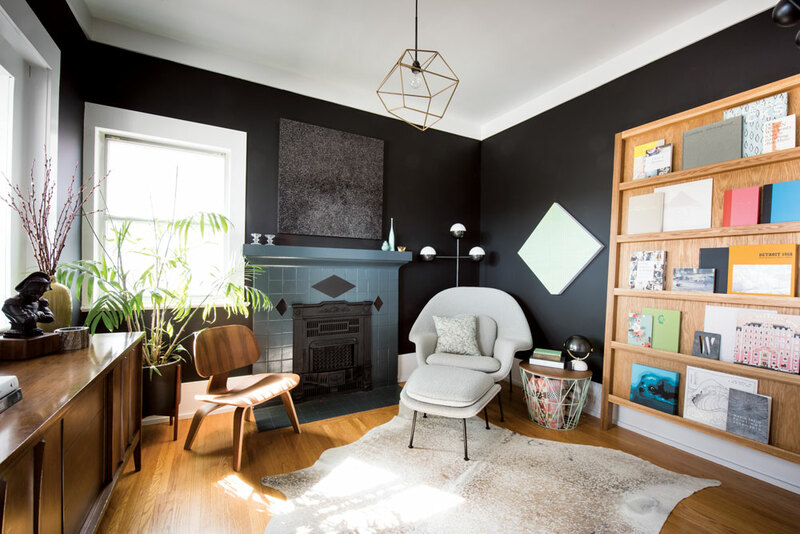 The easel-style bookcase lets book and magazine covers become part of the decor. Painting above fireplace by Mario Trejo, available through Herringer Kiss Gallery; Custom light fixture, available through Sarah Ward Interiors; Womb chair by Eero Saarinen for Knoll, available through Kit Interior Objects; Side table by Ferm Living, available through Kit Interior Objects; Painting on wall by Rhys Douglas Farrell, available through Herringer Kiss Gallery; Custom bookcase available through Sarah Ward Interiors; Cowhide rug from Tandy Leather. Playful sayings in unusual frames serve as art around the house. Vintage dresser; “Please Wait Here” by Ian Stevenson, available through theymadethislondon.com; Josephine Pendant, Metalarte, available through Lightform. 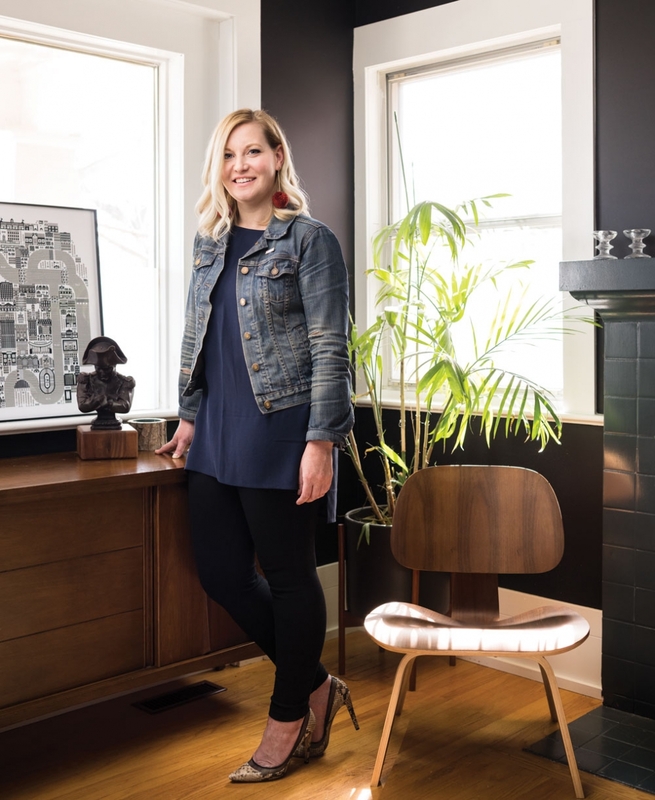 Designer and homeowner Sarah Ward stands next to a credenza purchased from Bex Vintage, a Calgary-based seller of mid-century furniture. Vintage credenza available through Bex Vintage; Modernica planter, available through Kit Interior Objects; Eames molded plywood lounge chair, Charles and Ray Eames for Herman Miller, available through Kit Interior Objects; Calgary print by Raymond Biesinger, available through Kit Interior Objects. 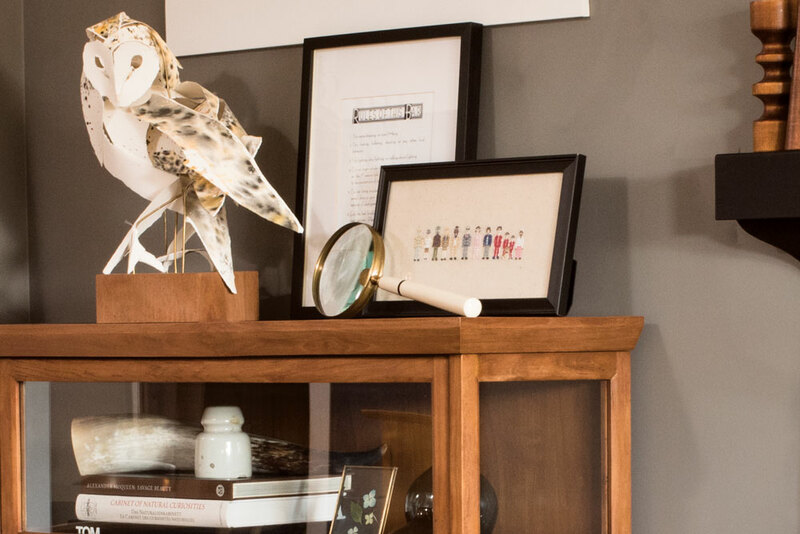 An owl sculpture from Australia, a painting of the Royal Tenenbaums and a framed list of “bar rules” from New York City, are some of the eccentric curios on display in the living room. 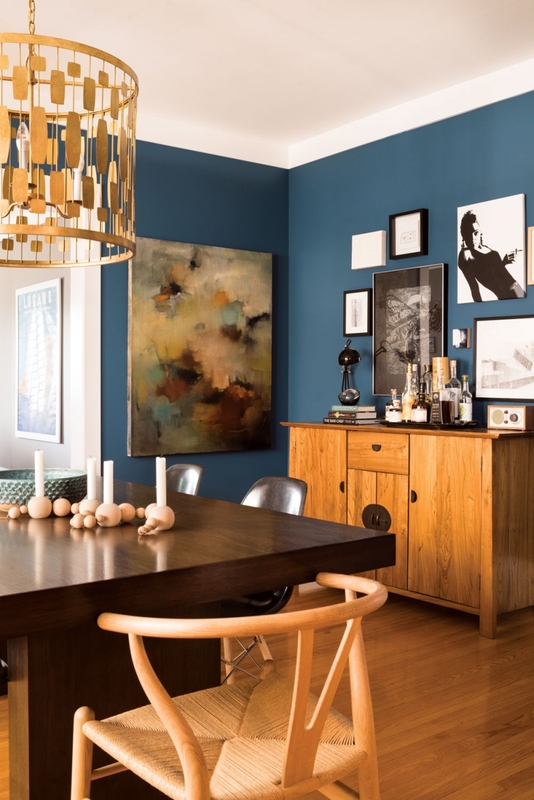 Saturated wall colours, such as the peacock blue in Ward’s dining room, make artworks stand out. Custom alder table available through Sarah Ward Interiors; Gold leaf chandelier, available through Sarah Ward Interiors; Wishbone chair, Hans J. Wegner for Carl Hansen & Son, available through Kit Interior Objects; Painting by Heidi Conrod, available through Herringer Kiss Gallery; “Edie” by Charlotte Ward; Liquor selection via Vine Arts Wine and Spirits. Ceramic bowl by Meredith Metcalf Ceramics; Candleholder string by Ferm Living, available through Kit Interior Objects; Eames molded fiberglass dowel side chair, Charles & Ray Eames for Herman Miller, available through Kit Interior Objects; Pinecone poster and leaves poster by Sharilyn Wright; Chiang Mai dragon drapery by Schumacher, available through Sarah Ward Interiors; Factory pendants from Schoolhouse Electric Co.; “Empty Belly” by Alanna Cavanagh. Petrie sofa from Crate & Barrel; Wool rug from Dwell Studio; Kelly Wearstler pillows available through Sarah Ward Interiors.